MissionFOTO’s first trip to the Gulf Coast was made 10 days after the storm to film for CrossRoads Missions. Over the next two years, we traveled to the Gulf Coast several more times with teams, volunteer groups and other missions, visiting and photographing several towns and cities including Biloxi, Gulfport, Long Beach, Bay St. Louis, Slidell and New Orleans. 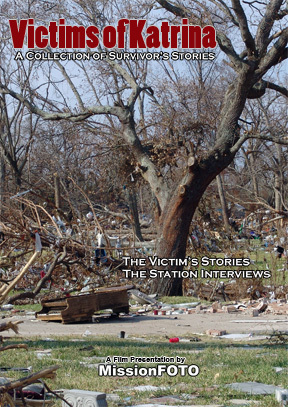 Over 200 interviews with survivors were taped. In early 2007, our realization was that the storm was still stirring in the minds and hearts of the many who suffered having experienced Katrina. In March 2007, MissionFOTO compiled some of these interviews into a collection. Victims of Katrina is currently being shown weekly to work teams in Slidell at the Slidell Christian Church by International Disaster Emergency Service (IDES), an organization dedicated to rebuilding the town of Pearlington, MS. Each week, MissionFOTO receives requests and mails copies of the film to churches and individuals who have worked in Pearlington. Victims of Katrina is available for purchase from MissionFOTO.